Combining the timeless sound and appearance of a classic acoustic piano with the convenience and flexibility of a digital piano, Yamaha silent upright pianos allow you to enjoy the best of both worlds. Whilst the romantic charm of the classic acoustic piano is very appealing, there are times when playing acoustically is just not practical. If you want to play late at night or early in the morning you may find yourself disturbing others, whilst at other times you may find there are too many distractions going on for you to concentrate. Silent pianos give you the flexibility required to play whenever is convenient for you, by offering you the ability to chop and change between acoustic and digital modes. Hailed as the future of the piano, we’ve taken a closer look at Yamaha silent upright pianos to help you to decide if they’re the right option for you. Silent pianos use sophisticated technology to combine the classic allure of an acoustic piano with the modern practicality and convenience of a digital piano. Silent pianos can be used in two different ways; as a traditional acoustic piano, or silently using headphones in digital mode. The same sensor technology gives dynamic touch control and contrast for a highly realistic digital experience. When in digital mode, silent pianos use sensor technology to translate key movements into digital sounds that authentically replicate acoustic playing. As the pioneers of sound muting technology, Yamaha offers silent upright pianos that employ highly advanced technology to create pianos that will remain current for many years to come. Having released the first silent piano back in 1993, Yamaha has been perfecting the sound and performance of the technology ever since. Today’s models provide such a natural sound in the digital mode that you will forget that you are no longer playing acoustically. There are two different versions of the Yamaha upright silent piano available; the SH and the SG2, as well as several models of each to suit a variety of budgets, requirements and abilities. The two different versions feature a lot of the same functions including a modifiable digital tone and pre-installed samples. The SH includes several additional advanced features useful for professional music production and recording. These include USB audio recording and the option to manipulate audio playback. Audio is recorded as WAV files which can then be imported to music software for further production and sharing. 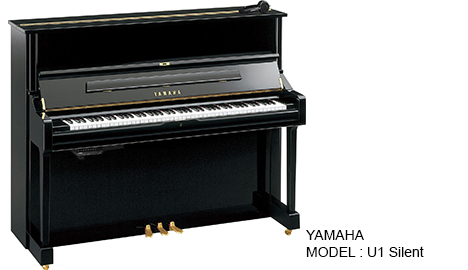 Read more about the different models of Yamaha upright silent piano available at Markson Pianos. For further advice or information on our range of Yamaha silent upright pianos, give our experts here at Markson Pianos a call on 020 7935 8682.